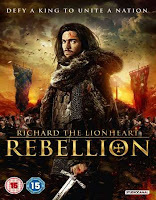 Richard the Lionheart Rebellion 2015 | FunToMovies 300 Movies '+g+"
Story: The year is 1173. England and France are at war. The destiny of the two great powers has never been so intertwined. As King Henry’s wife, Queen Eleanor, is captured and imprisoned by the king himself, Richard and his brothers lead the fight against their father in a heartless war. Allegiances shift with each victory or defeat as the destinies of England and France keep swaying in a delicate balance. Released Date: 11 June 2015. Film Stars: Valeri Alessandro, Elisa Allara, Lucia Allara. Movie Quality: 720p HEVC BRRip.